The Other DAREDEVIL | Warped Factor - Words in the Key of Geek. Nathan Browne picked the short straw. Or did he? I'd never seen 2003's Daredevil. 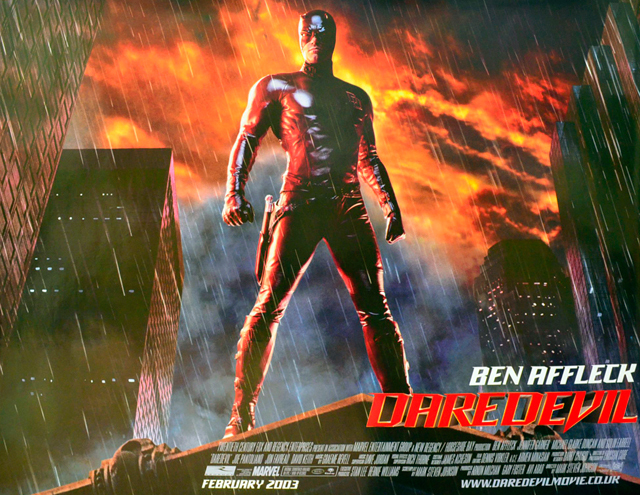 I'd been told it was terrible, one of the worst Superhero movies ever, and that Ben Affleck was dreadful in the role of Matt Murdock/Daredevil. Having watched series one of the Netflix production of Daredevil and thoroughly enjoyed it, I was hesitant to even contemplate watching this film just in case what I saw could not be unseen and in some way may spoil the excitement I'm feeling for the release of series two and the prospect of seeing Affleck as Bruce Wayne/Batman on the big screen. However a friend of mine leant me the director's cut of the movie on DVD and assured me it wasn't as bad as everyone makes out it is. He was right, it was actually pretty good! As I say, I've yet to see the original theatrical cut but the director's cut is a solid example of a comic-book movie. This version restores about 30 minutes of material, coming in at 133 minutes. It's not perfect but in no way does it deserve to be mentioned alongside the likes of Fantastic Four and Green Lantern as examples of genre bombs. Netflix still have the edge by a long way, but then they had 13 hours to build a story and really flesh out the characters, but writer/director Mark Steven Johnson makes an admirable attempt in bringing Daredevil to the masses for the first time. 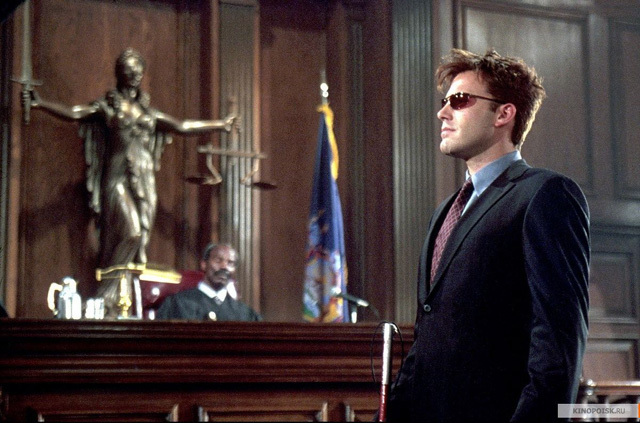 Ben Affleck makes for a great Matt Murdock, and the story gives him ample time to portray the tortured soul that Murdock is, but very quickly Affleck makes you believe that his Murdock is the kind of guy who would wear a costume and spend his nights beating the crap out of criminals. He's emotionally distant, has a lot of guilt about what he does, second guesses himself and is very angry on the inside. As a lawyer, working with his partner Foggy (played here by Jon Favreau in an equally impressive performance), he encounters the worst people imaginable every day and is fed up with seeing the ones who have the right connections or enough muscle to intimidate witnesses worm their way out of an appropriate sentence. No wonder he's so angry. But we also get to see another side of Murdock, as there are moments when he's just a guy, he tells jokes, he flirts with women and he has friends. A regular guy who takes advantage of his powers but also feels the burden of them. As you may well know if you're familiar with the comic book or Netflix series, those powers came about when Matt Murdock was a boy after he was blinded by a chemical spill. His remaining senses began to fill in the gaps, becoming enhanced to a superhuman level, so now as an adult Murdock uses his sonar-like hearing to walk around as if he could really see, but still lives his days as if he is just a regular blind guy. It's the perfect disguise for his superhero alter ego, Daredevil. One of my favorite scenes from the movie happens when Daredevil is just as he's about to call it a night after getting into a vicious fight with a dozen thugs. He's about to lie down when, thanks to his enhanced hearing, he hears the screams of a woman being murdered. He perks up a bit, then looks discouraged. He knows there's nothing he can do, and if he went out in the exhausted state that he is he would only get himself killed. It's a difficult thing to do, but he must go to bed and try to let it slide, for now. Affleck nails this depiction here, and this scene coupled with the clever detail that Murdock sleeps in a sense deprivation tank in order to get some peace and quiet really impressed me. When it comes to the supporting characters there's a lot to like. As well as Favreau's impressive portrayal of Franklin 'Foggy' Nelson, we have Affleck's soon-to-be-wife-of-the-time Jennifer Garner as Elektra Natchios. There's real chemistry between her and Affleck and Garner brings a lot of different facets to her performance. Her Elektra is not just slowly reduced to a 'Mary Jane' type character, ending up as being some damsel in distress that needs to be rescued during the climax, as one has often witnessed in these types of movies, so I was pleased with that decision. Bullseye, played by Colin Farrell, is the primary antagonist, and he's not a character that I'm overly familiar with, but what I like most about him is that he's depicted as delightfully evil, a sociopath that kills people in increasingly difficult ways, just because he enjoys it! He doesn't use guns, as they are for your run-of-the-mill assassins, instead Bullseye's weapons of choice will make you look at pencils, toothpicks and office supplies in a totally different way. I also enjoyed the fact that he's given a real character. He's full of himself and very proud of his skills, to a fault. He also appears to suffer from some sort of OCD because he's always being overly theatrical and boastful, but in a way that's believable. I've never been a fan of Farrell's but he delivers a good performance here. 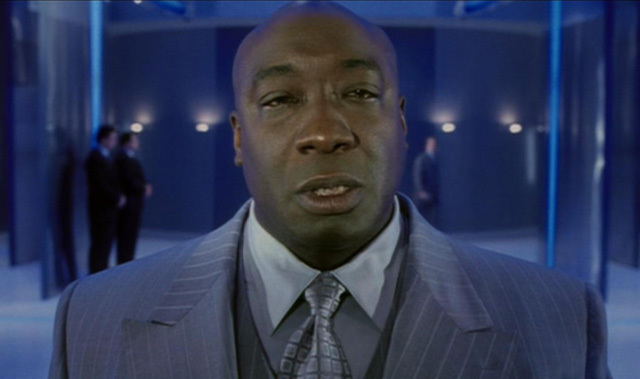 Then we have Michael Clarke Duncan as Wilson Fisk/Kingpin. Oh, and it's so difficult not to compare him to the brilliant portrayal by Vincent D'Onofrio in the Netflix series. Truthfully, D'Onofrio wipes the floor with Clarke Duncan, but that's not to say his take is not an interesting one, and if the Netflix series hadn't have come along then this would've been perfectly fine. Clarke Duncan has a powerful on screen presence. His Fisk is suitably scary all the time, but not in an obvious way. I didn't find everything about Daredevil to be perfect, for instance it's lacking a bit in action as it's heavier of character building. Whereas the Netflix series could afford to do this over 13 episodes, when you only have two and a quarter hours it's hard to find the right balance. Here the scales aren't quite level. I didn't find the balance enough to detract from my enjoyment though, but it is something I noted. Also, and this is solely down to the age of the film, some of the CGI is dated. I was left feeling that practical effects would've suited the film better, and also stood the test of time too. 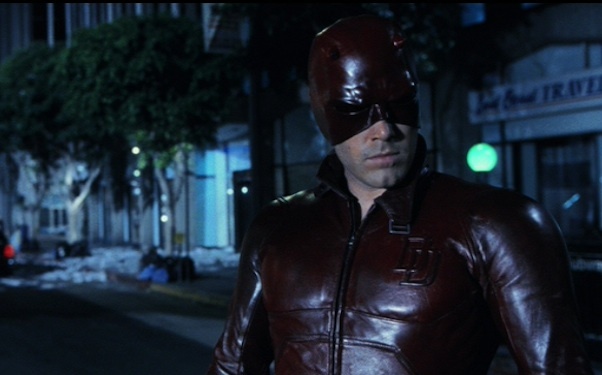 But all in all, the 2003 take on Daredevil works surprisingly well. It really is an entertaining film filled with interesting characters and complex relationships. Affleck brings a lot to the role and has me even more excited for his take on Bruce Wayne/Batman now. Grab the director's cut of Daredevil, I think you'll be pleasantly surprised by the drama and how well developed all of the characters are. It's not as good as the outstanding Netflix series, but it very admirably captures the spirit of the characters and the dark edged Marvel comic books they come from.